I received this book from the author/Netgalley in exchange of an honest review. First of all, I was a bit worried about this book, I read the second book in this series some time ago and I didn’t like it at all for various reasons. So I was worried that this book would be the same. I will post a small timeline on my feelings about this book. First part: Oh, guys and being outsiders, trying to make a band. yawns Middle part: hears about what Jacoby has (had suspicions) and we also find out several other thingsBook becomes better, insert me sniffling. Last Part: Oh no cries. 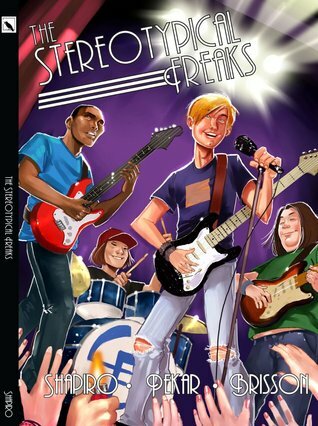 The first part of the book was pretty boring, there was some drama, some stereotypes flying about, 2 boys having a band and one of them wants to participate in the Battle of Bands of their school, but then we met with Mark, and we met Jacoby. A character I really grew to love. Immediately when Jacoby was introduced I just had that feeling that there was something wrong with him. There were the little hints. The things our main character and his friend talk about (Jacoby missing school often, suddenly living with his Aunt), but also what Jacoby said (stomach hurting (which he said, but before he said that you could see he was planning to say something else), calling his Aunt differently, the way he looked when he said stuff). And when a bit later we found out, it just broke my heart. And though I won’t say much more, it also hit close home for me. After that the story quickly changed from quite light-hearted and filled with some daily drama, to a story filled with a guy living his life to the fullest, trying everything, doing everything, and also helping everyone else. Because that is what Jacoby did. Instead of moping or crying or just doing stuff people often do when they hear the news that Jacoby got, Jacoby went to live his life to the fullest, he participated in the band, and he filled his friends with words of wisdom. Even helping them out with things. For instance Mark who wasn’t sure to whom he should be loyal. To the band? To his jock friends? Jacoby had some great words that helped out Mark. Or Dan, whose dad is never around and instead sends the most expensive new gadgets he can. It was just absolutely fabulous and I was just sniffling and clapping for the guy who is so selfless and so wonderful. Of course Jacoby’s illness, and (I will put this under spoiler tags) death hit me hard. As the book continues you can see him get less and less in everything. Losing weight, becoming weaker and weaker with each day. He knew he was going to die, just not when, and it was heartbreaking to see him fight, to see him just want to do everything before he lost this battle he was still fighting, and it was even more heartbreaking at the end, when we knew that he wouldn’t be able to fight any more. To know that he will be soon gone, gone from this world after a big struggle with the vicious disease that is cancer. I felt so sorry his 3 friends, who even went to see him, even if that meant flying and a big journey. All that just to see him, to see him one final time. They stayed with him, they watched a dvd of their band and they gave him the trophy they won. I just cried at that part, they knew that as soon as they went through his bedroom door, as soon as they went away from him, that they wouldn’t see him again. My God, that just hit me so hard. Everything was already heartbreaking, and I can’t imagine how hard it must be for 4 guys who got together, who became quick friends, to have to say farewell to one of them. To know that they will never see him, that this is truly the last, final time for them to say their things. The other characters were also interesting. Tom was great, though I got a bit tired of him pining for a girl and never trying to talk to her or tell her his feelings. I didn’t like how he kept moping about it. He had his chance, don’t cry or mope or get angry when someone does talk to her and she likes him back. Mark was a good character though I didn’t always like him, the way he tried to juggle his jock life with the band and his friends there. The way he talked. But as the story progressed I saw him change. Mostly because Jacoby tried to talk to him about stuff. Then we have Dan. He was quite cynical at times, but also quite hilarious, and I loved how he was the one to try to push the band to perform. He wanted more for the band, more than being a basement band that was just doing songs that no one would hear. I also felt sad for him, the dad situation wasn’t the easiest one and I can imagine he is sad and angry towards his dad. Wouldn’t anyone? The art was one of the thing (other than the slow start of the book) that prevented me from rating this book a 5 star. At times the art was pretty good, but quite often it looked like we just were reading something out of a sketchbook. There were helplines (or whatever the name of those lines are), it looked hurried and unfinished. At times stuff was drawn with black ink, at times it was just normal pencil strokes. Again at times it looked pretty good, especially closer up, but I think that in Graphic Novels the art is one of the most important things, next to the story. The art breaks or makes it. And I just feel that it could have been better in this one. Would I recommend this one? Yes, though like I said, the book begins quite slow, but don’t give up, just push through and you will be rewarded with an amazing book about a difficult and very sad topic.